It’s known as an Army town, but Fayetteville, N.C., is developing a reputation for collision repair as well. Wednesday at 10 a.m., auto body repair, equipment and insurance dignitaries will visit the city to celebrate the opening of Fayetteville Technical Community College’s revolutionary Collision Repair and Refinishing Program. Classes have already begun; the first 17 students, who call themselves “Team One,” will graduate in 2016. The buy-in from industry players, both in helping to design the program and committing to serve on its executive board, has not gone unnoticed by the students. On their first day, program coordinator Paul Gage dealt out business cards from industry participants and stressed their personal support for the program. “FTCC’s curriculum will shape the future of education in the collision space,” he said in a statement. The program is heavily influenced by I-CAR. Anyone passing it will get six I-CAR platinum designations and three welding certifications, as well as Auto Service Excellence B2-B5 certifications. They’ll also get a job. Gerber Collision & Glass has guaranteed positions for “Team One,” and other employers are doing so as well, FTCC said. Even if that wasn’t the case, a shortage of qualified techs means a graduate could write their own ticket. The college estimates 180,000 jobs will need to be filled in collision repair and insurance over the next few years. The college also has the necessary tools onsite for students, saving them what could have been as much as a few thousand dollars. In addition to a shortage of qualified technicians, the industry also must contend with increasingly complicated automotive technology and repair processes — not just with materials like aluminum but more advanced diagnostics and safety-related sensors. The collision repair building on Procurement Circle is 25,000 square feet and will make local body shops jealous. It has two frame alignment systems; an aluminum clean room; two frame alignment systems, waterborne equipment and a waterborne paint refinishing system; welding options running the gamut from smart MIG for aluminum, silicon bronze and steel to squeeze-type resistance welders to nitrogen plastic welders. It’s state-of-the-art — or at least until automotive technology changes yet again. 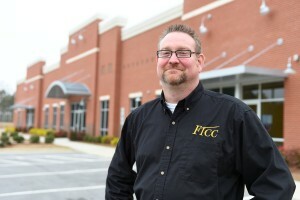 The college cost $4.45 million, including a $3 million loan from Cumberland County, N.C., $1 million in donations and discounts, and $450,000 from FTCC in upgrades to the building. Its final price tag was unclear, but the college received $3 million in financing from Cumberland County, N.C., as well as help from industry players, according to a Fayetteville Observer report and FTCC. Insurance companies — which are facing the same complexity in damage appraisals and shortage of incoming skilled workers as the collision repair industry — will also benefit from the program in the form of more experienced appraisers. The college offers three tracks: refinish technician, nonstructural technician and estimator. The two industries have a complicated relationship, and perhaps the students and executive committee members working together in such close proximity will allow a greater understanding of each other. Editor’s note: FTCC provided some clarification into questions we posed in the initial version of this article about hiring guarantees, students’ tools, and the cost of the facility. The article has been updated to reflect its answers.